Royal Caribbean's Splendour of the Seas arrived today in Salvador for her ninth season in Brazil after travelling from Europe. Splendour of the Seas' first cruise in Brazil this season will begin on December 8th and offer three to seven night cruises to Brazil, Argentina and Uruguay. As part of Splendour's return to Brazil, a small commemorative event was held announcing the ship's arrival. 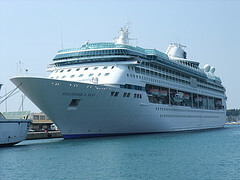 Splendour of the Seas is returning after having had a revitalization that breathed fresh life into the ship, which added a number of new ammenities to the ship such as restaurants and onboard activities.